With the help of this module, the admin can integrate Magento 2 store with Endicia platform for creating USPS shipments. Magento 2 Endicia Shipping extension will allow the admin to directly create shipments for orders from Magento backend. Further, the admin can check Endicia account details, buy additional postage, and print USPS shipment label in PDF format. The admin needs to have an active account on Endicia and USPS. Admin can Buy Endicia Postage. Admin can check the account details. Endicia shipping rate will be calculated from the store’s address. Admin can enable or disable USPS Endicia Shipping method. Admin can set the USPS Endicia shipping method name that will be shown on the storefront. 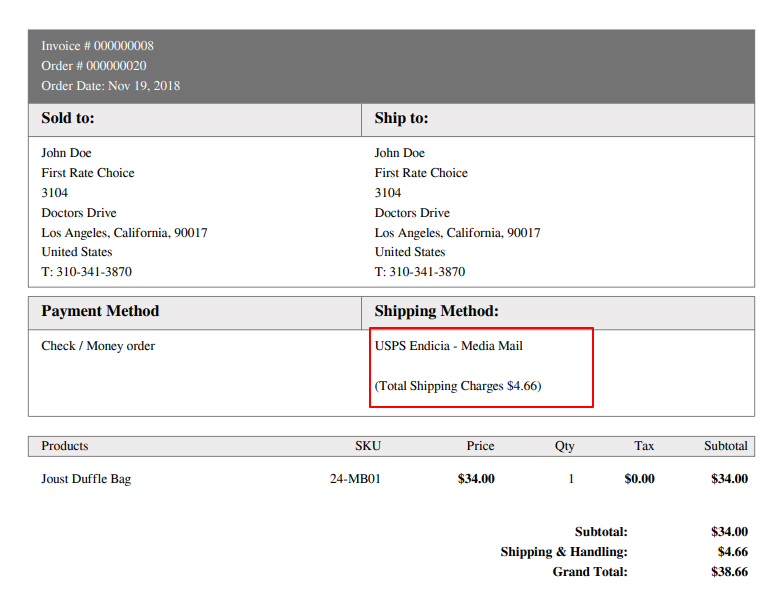 Admin can download USPS Endicia Shipment Label in PDF format. Supports International Shipping Rates and Shipping Label. After downloading the module zip file, extract it and go to src>app. Now, you need to upload the app folder to the root directory of Magento installation. 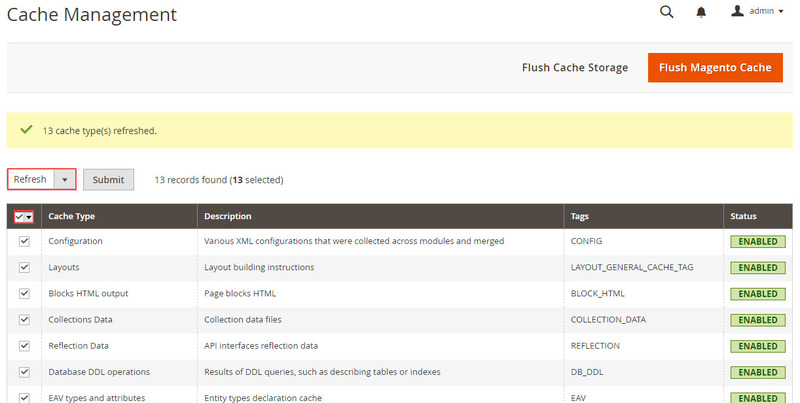 Go to System>Cache Management and refresh all the cache types. For translating the module language, please go to app>code>Webkul>UspsEndicia>i18n and edit the en_US.csv file. Now, translate the words on the right and upload the modified file to the same location. The filename of the translated file should be according to the language and region code like de_DE.csv. How To Get Endicia Account Credentials? At the time of creating a new account on Endicia, you set your Passphrase. And after your account is created successfully, the Account ID is sent to your registered email address. 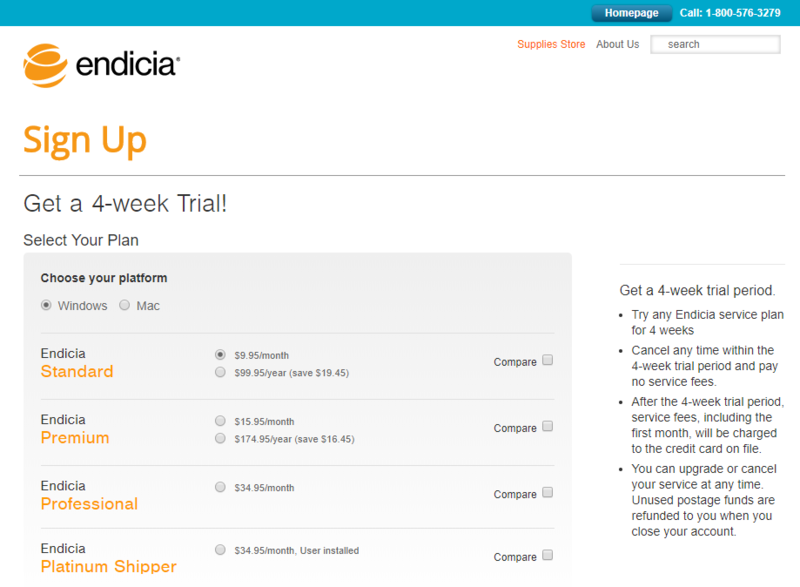 To create a new account on Endicia, click here. 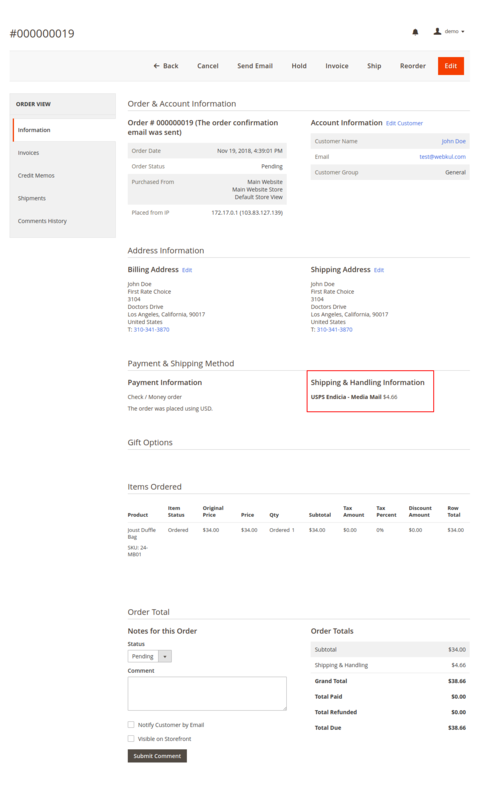 Enabled for Checkout – Select Yes to show USPS Endicia shipping method at the checkout. 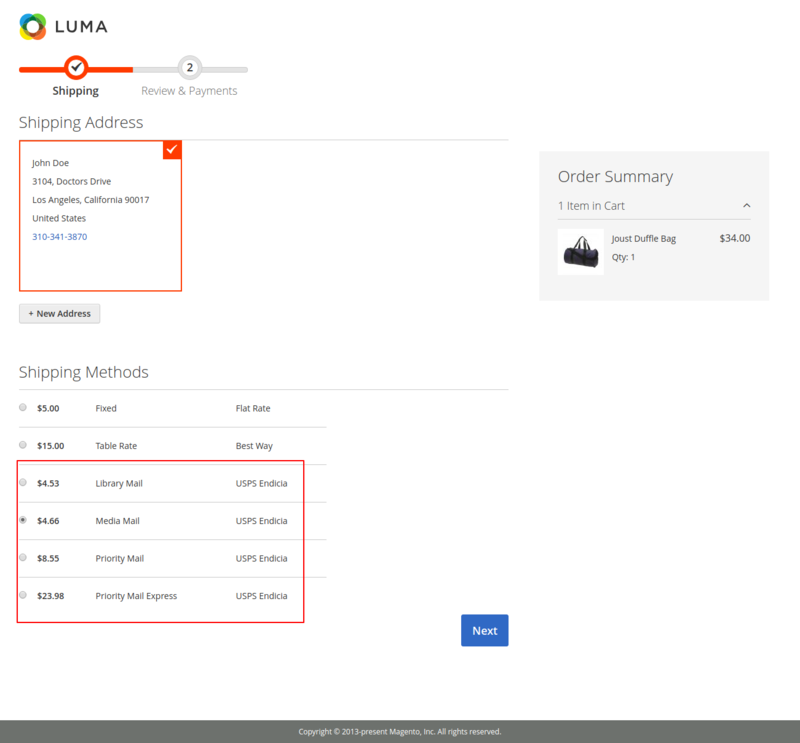 Else select No for hiding this shipping method. Mode – Select Development option for testing the module for any bug or error. Else select the Live option to enable the production environment. The Production Server contains the live version of the Endicia Label Server Web Service that generates shipping labels with ‘live’ postage. 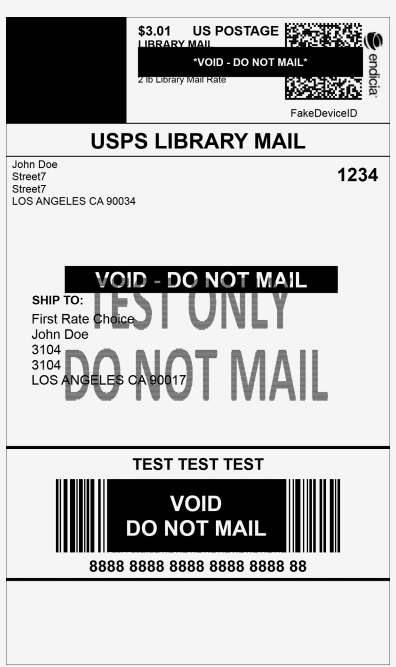 The Test Server contains a test version of the Endicia Label Server Web Service that only generates ‘test’ shipping labels with VOID postage. This allows you to develop and test your application calls to the Endicia Label Server Web Service methods. The Production servers can only be used with a live ELS account and a PassPhrase. Title – Set the frontend title for this shipping method. Account-ID – Enter your Endicia account number here. 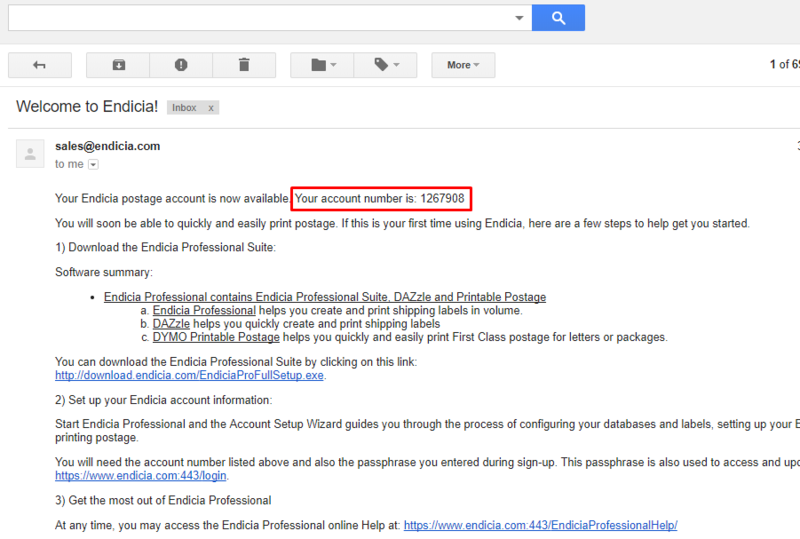 Endicia assigns a unique Account ID when you sign up for the Endicia Label Server Web Service. The Account ID is associated with an Endicia postage account and holds information about postage transactions as well as available balance for printing postage. Passphrase – Enter your Endicia account passphrase here. The Pass Phrase is a long and complex password. During the new account sign-up process, you will be asked to select a temporary Pass Phrase for the account. Machinable – It is set to Yes by default. If the mailpiece is non-machinable, please select No. 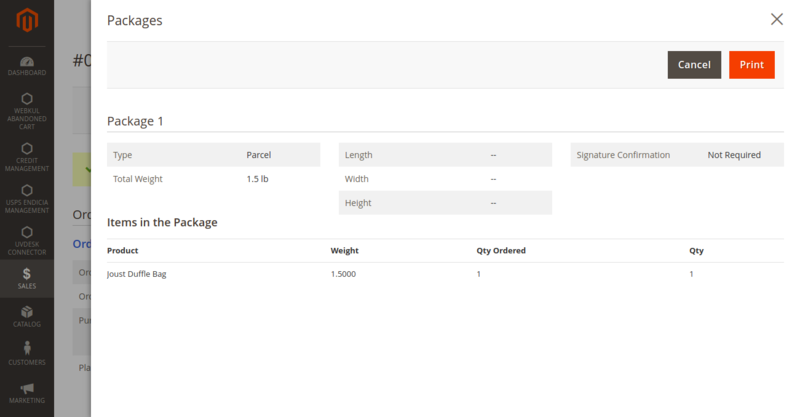 In case a parcel select ground mailpiece is marked as machinable is over 35 lbs. in weight, it will automatically be charged for the non-machinable price. The Admin can enter the default Width, Length, and Height. Endicia Mail Class – Select which mail services to display to customers during the checkout process – Priority Mail Express, First-Class Package Service, First-Class Mail Parcel, Library Mail, Media Mail, and Priority Mail. Calculate Handling Fee – The admin can set the handling will be fixed or percentage. 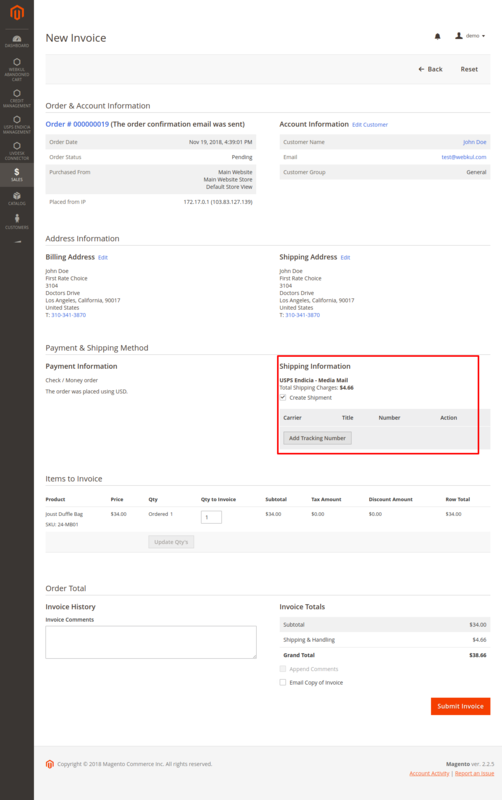 Handling Applied – The admin can set the handling fee will be applied on per order or per package. Handling Fee – The admin can enter the handling fee. Free Method – If the admin wants to set a free shipping method then the admin can set an free Endicia shipping option. Enable Free Shipping Threshold – Here, the admin can enable /disable threshold amount for free shipping. Free Shipping Amount Threshold – After enabling free shipping threshold, the admin can enter the threshold amount. 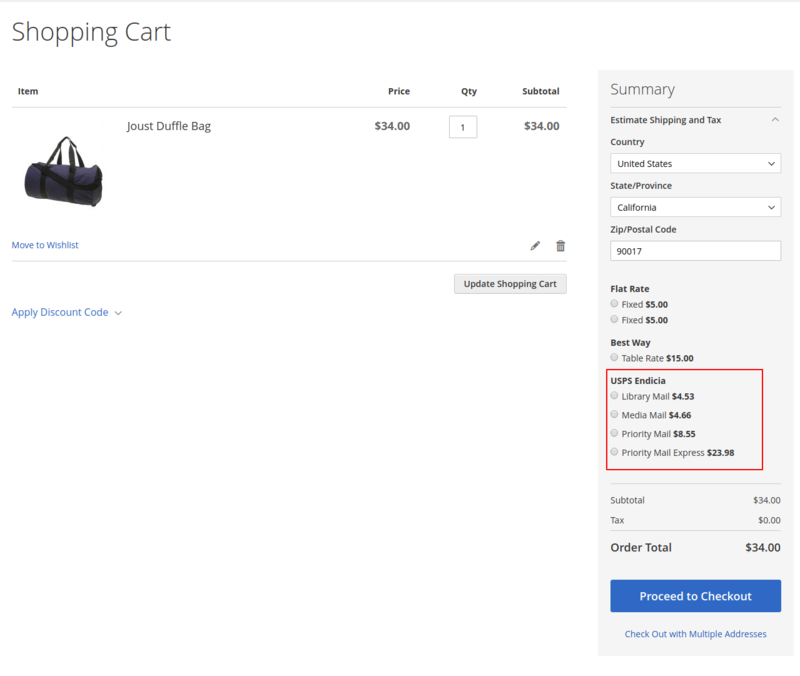 Displayed Error Message – Enter the error message content when the Endicia shipping method is not available to the customer during the checkout process. Ship to Applicable Countries – The admin can set shipment applicable for all countries or for specific countries. Ship to Specific Countries – The admin can choose specific multiple countries for shipment. Show Method if Not Applicable – Select Yes to display Endicia shipping even if it is not applicable to the delivery address. Sort Order – The admin can set the Sort order. The admin can manage its Endicia account by going to USPS Endicia Management > Manage Endicia Account. From here, the admin can check the Account Id, Account Balance and buy Postage easily. The admin can purchase postage the stamps by entering the preferred amount in USD. Please make sure you have enough balance on your Endicia account. 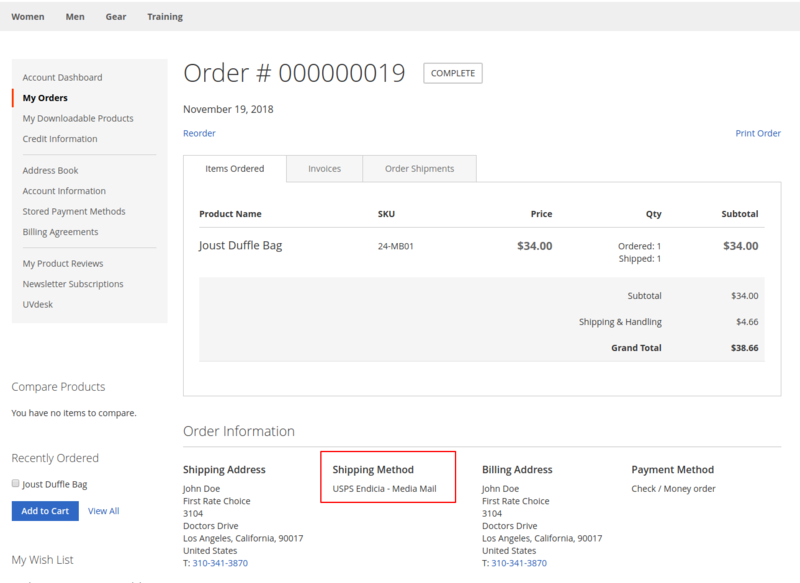 The customer can check the shipping rates from the shopping cart and estimate the shipping costs and the taxes without going through the checkout process. At the time of the checkout process, the customer will see all the available USPS Endicia shipping services with the cost. 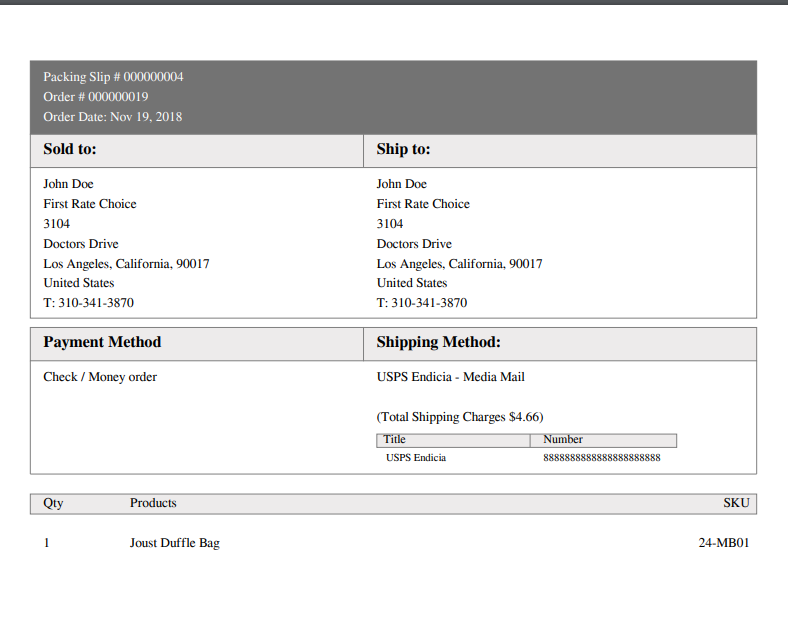 The admin can print the invoice and download the PDF mentioning Endicia USPS shipping method. See the sample invoice below. Once the admin creates the shipment, the admin can print and download the Endicia USPS shipping label. 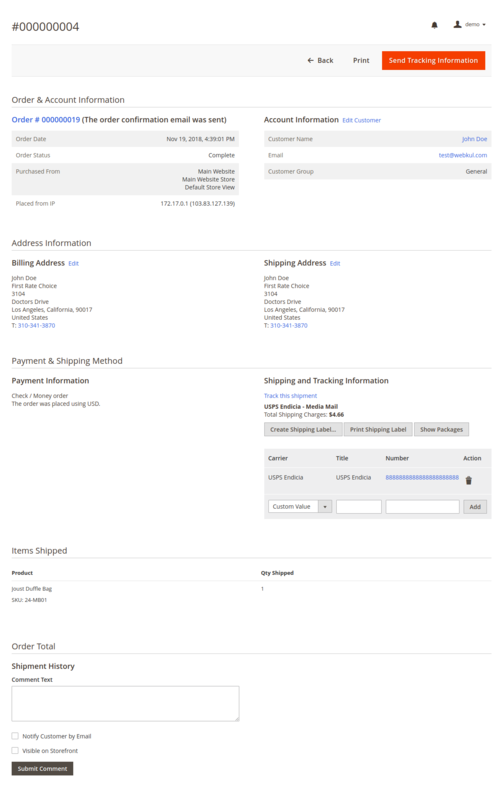 The tracking information will be added automatically, the admin can also send the tracking information to the customer.